The following group types are not accepted by this hostel: Holiday with Friends, Business Trip If you have misrepresented the type of group you are booking for, your booking may be cancelled by the hostel." 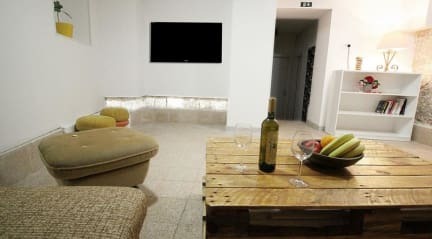 If you are coming to Split and looking for comfortable, pleasant and affordable accommodation – Hostel Like Me Split is ideal for you. Common room's called 'Split'. This is place for enjoying, relaxing and meeting with new friends after amazing day in Split. Located on Split main street this former factory has been transformed into a visitors dream, offering every facility. With a gorgeous sun terrace overlooking a beautiful garden, it is the ideal surrounding to rest at and have a drink after a day spent exploring the beautiful city. The Hostel is situated in old town of Split in part of city called 'Veli Varoš'. 'Veli Varoš' is one of the oldest parts in Split. 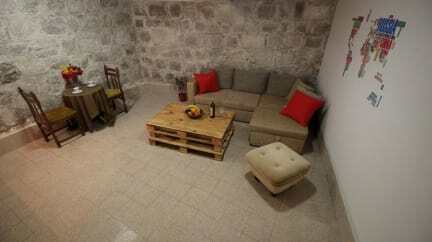 The hostel is situated in center of old town 200 meters from famous Diocletian Palace. All restaurants, shops, bars are situated few minutes walk from hostel. Distances from ferry port and bus station about 8-10 minute walking. All city and cultural happenings are also about few minute walking from hostel so our guests can easy walk and enjoy a town and beautiful s of Split. Hostel Like Me Split has 5 bedrooms and 4 bathrooms. We have one private room called 'Paris' for two people, one room on two levels for four people called ' New York' and three dorms per six people called ' Dubai, Shanghai and London'. Private room and dorm rooms big and small, all on offer here at unbeatable value. Of course all the usual's are free, WiFi, linens, towels, lockers and our traditional rakija welcome drink with our experienced helpful staff means your stay will be a happy one in the Hostel Like Me. Our dorms all have AC and secured lockers. Join us and become part of 'Like Me' story. For late check in time time you should contact us before. The hostel is welcome for all ages. Thank you for good hospitality. Brilliant hostel. Easy walk from arrival point and day tour leaving points. I extended my stay twice just due to the awesomeness of this hostel. I made friends for life here. We held an impromptu Jenga World Cup one night in the common area. I will only stay here whenever I visit Split. The staff were lovely and full of great advice from everything from which day trips are good value to what to do with severe sunburn. The hostel was very great value for money. Rooms were clean , everyone had their own lockers and staff was very happy to help with anything you needed. Kitchen downstairs was a bit small but rooms were big and clean, air con worked and was a short walk to the main part of town. Excellent location: close to the old town, grocery stores and restaurants. The hostel is ok but I think you can do better. The common area is a bit gloomy and people don't really hang out there. I didn't like the shower because you barely had space to but your dry clothes, so in the end everything got wet. Everything was really clean though and the staff was perfectly nice. Overall the place is pretty good! Big lockers to store your stuff which is good, don’t plan on being able to cook much other than with a sandwhich press and microwave though. Locations pretty good and met a few different travellers. Some staff were lovely, others were less helpful Probably would stay again. Stayed here for four nights the hostel was in a good location really close to the town and the harbour so perfect for heading to restaurants and entertainment on an evening and perfect for trips and the beach during the day. Beds were comfortable and had charger ports per bed which is always useful for the modern traveller. Lockers were very good size as I could fit my large backpacking pack into the locker, which left me knowing all my stuff is secure whilst I head out for the day or night.